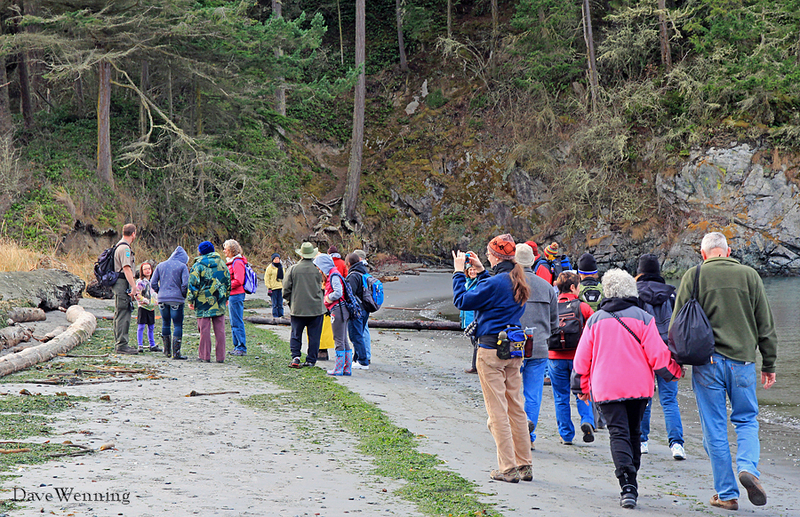 On New Year's Day, First Day Hikes were conducted in state parks all over the US. 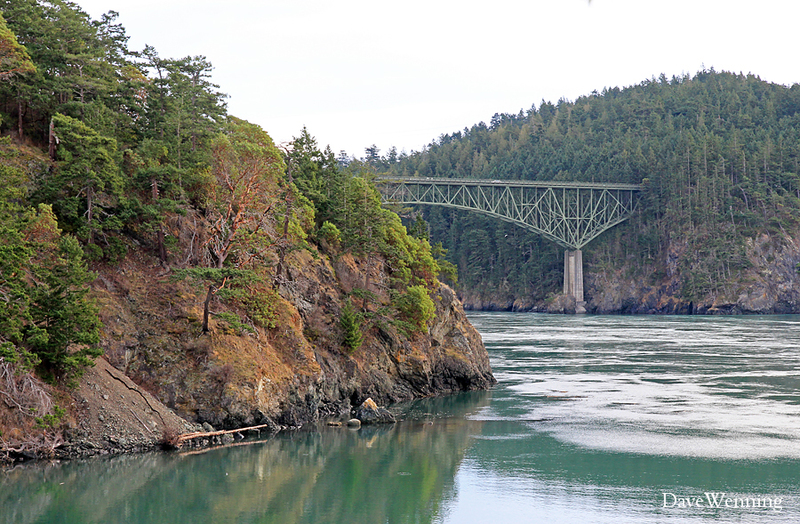 Nearby Deception Pass hosted one of three such events in Washington. 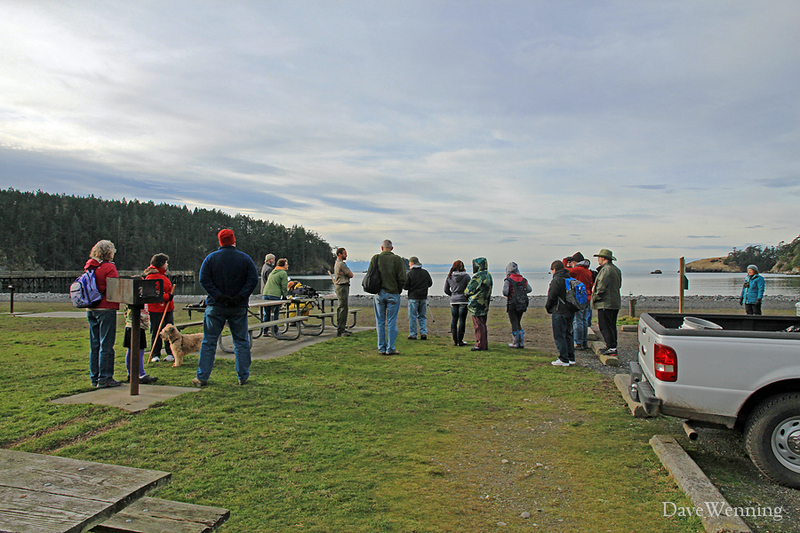 At 11 AM, we gathered at the Bowman Bay parking lot. The weather cooperated nicely with temperatures in the 40's, partly sunny skies and only a very light breeze. 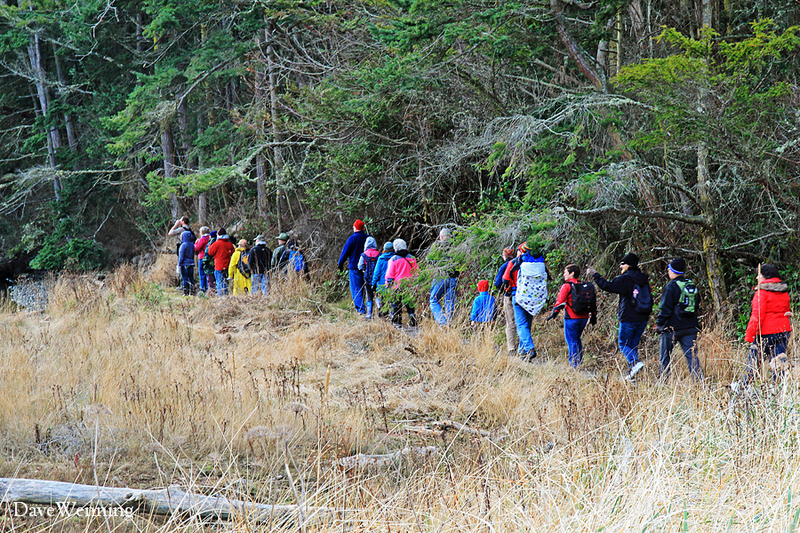 While some of us were bundled up for winter, our ranger guide appeared to be comfortable in shirt sleeves. As it would turn out, the day provided a sampler of many of the sights and activities the park has to offer. We headed south to the Lighthouse Point trail. We immediately began to climb up steep switchbacks for a short distance. Near the top, the trail levels and hugs the cliff side giving us a terrific view of Rosario Head across Bowman Bay. Beyond is Lopez Island in the San Juans. With a sharp bend to the right, the trail descends back down to the beach. 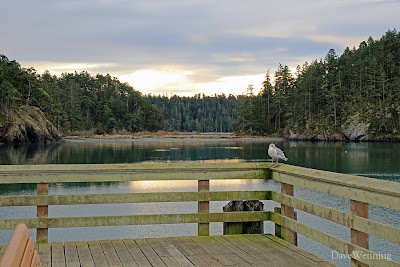 Here we find ourselves on the tombolo or sand bridge that connects Reservation Head to Fidalgo Island. 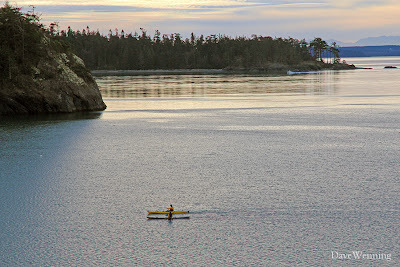 Bowman Bay is on one side and Lotte Bay is on the other. A special treat this day was meeting Linnea, a photography and blogging friend. We have communicated by email and through our blogs, but this was the first time we met face-to-face. 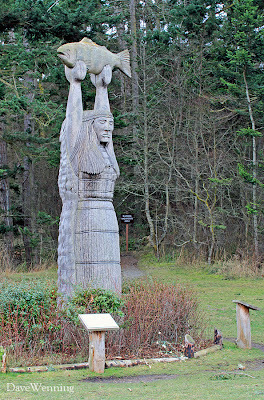 From the tombolo, the trail now veers right into the woods on Reservation Head. Another short climb put us at the edge of a cliff again, this time over Lotte Bay. 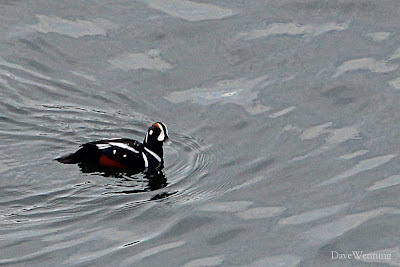 Rafts of Goldeneyes were diving in the sheltered waters. About half way along the trail, the trees opened up at a large stone outcrop. 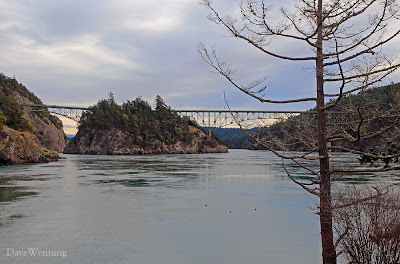 Here we got the first glimpse of the Deception Pass Bridge beyond Lotte Point. The green you see in the water is not a trick of editing hocus-pocus. From certain angles, the waters of Bowman and Lotte Bays really are that color. 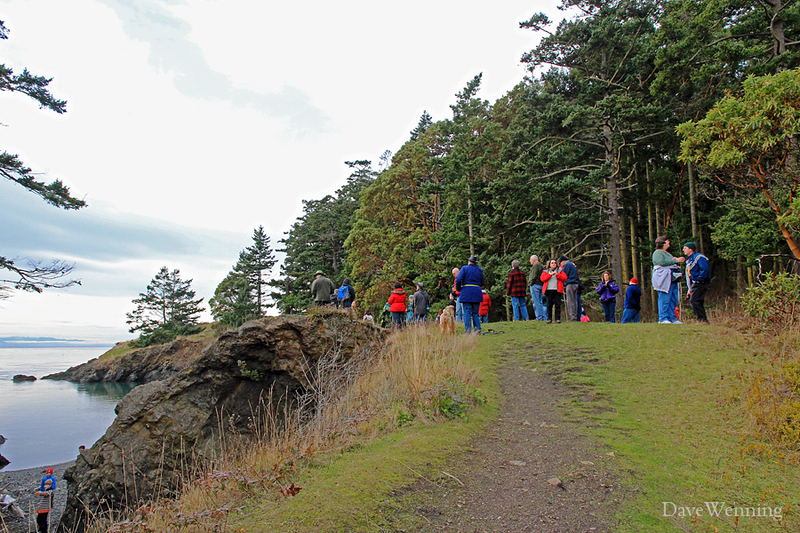 The trail emerged from the woods at the grassy headlands overlooking Deception Pass. From here it was possible to scramble down to a small beach. Lighthouse Point provides some of the finest views of the bridge available from land. The tide was going out and the water was moving swiftly toward us through the Pass. The ranger told us there once was a real lighthouse tower here. It was taken down by the Coast Guard some years ago and replaced with the small mechanized light visible near the center of the photo. 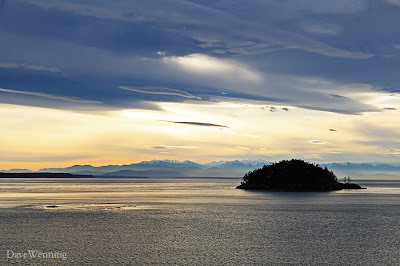 It actually sits on a small island separated by a narrow chasm. Again, we found ourselves high above the water at the edges of precipitous drop-offs. 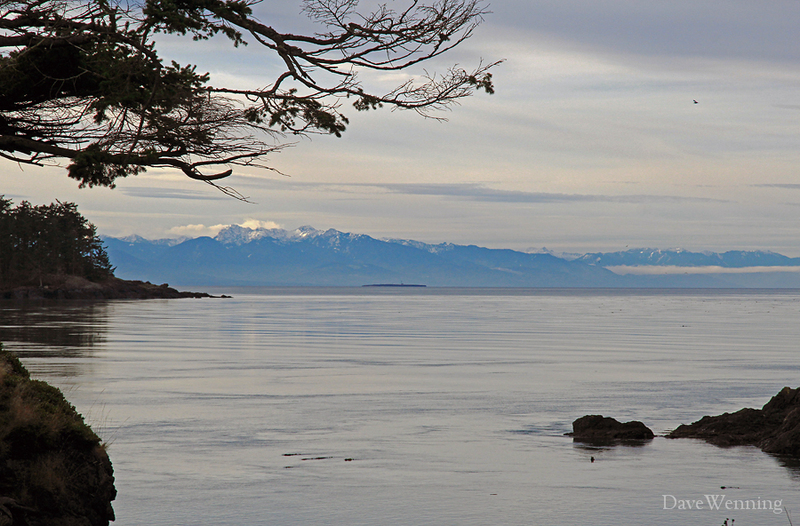 On clear days, the Lighthouse Point headlands offer stunning views of the Olympic Mountain Range. Across the Strait of Juan de Fuca, the mountains were about fifty miles from where we stood. Back at Bowman Bay, the official First Day Hike was over. From the end of the fishing dock, we caught a glimpse of the tombolo across the bay that served as part of our trail. Reservation Head is on the right. The old ranger keeping watch on the dock looked like he'd been around the bay a few times. Linnea and I were not ready to go home yet. Instead we headed north across the picnic grounds to the Bowman-Rosario Trail. 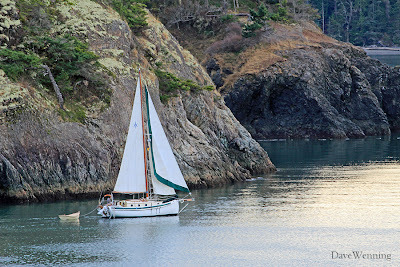 Another quick climb put us at the edge of a high cliff again with more great views over Bowman Bay. 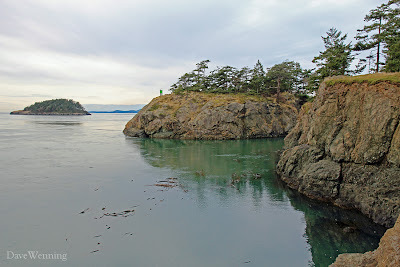 Beyond the tip of Reservation Head is Whidbey Island across Deception Pass. 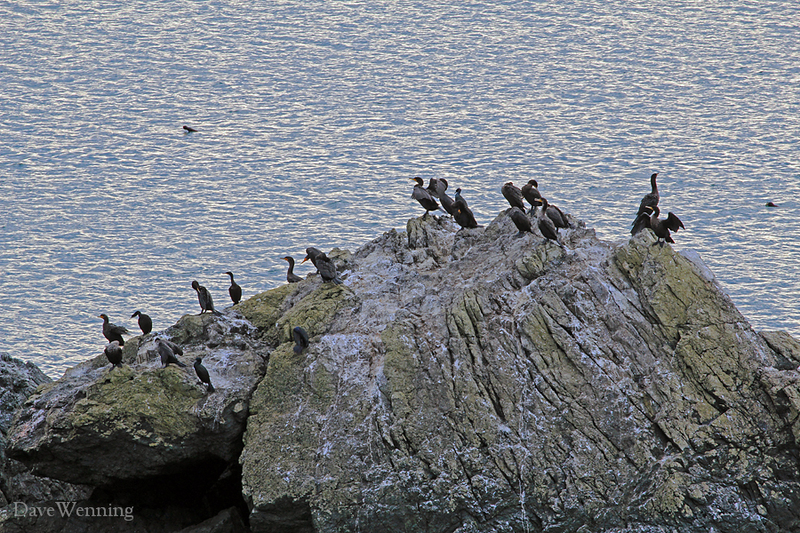 Below us in the bay, this rock is a favorite spot for Cormorants to gather after feeding. Here they will dry their wings, rest and socialize. 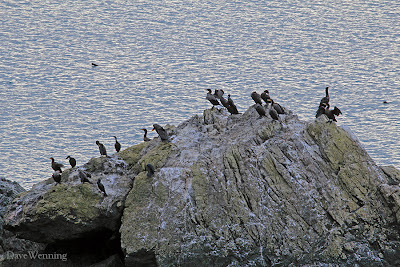 It's hard to tell from a distance, but these are probably Double-crested Cormorants (Phalacrocorax auritus). 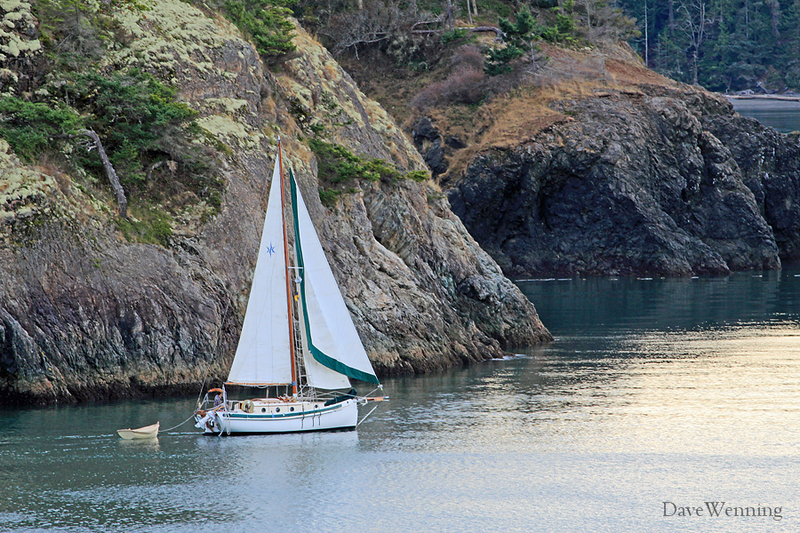 Whatever your passion, you can probably find it happening year around at Deception Pass. When we arrived at Rosario Beach, we were greeted by Ko-Kwal-alwoot, the Maiden of Deception Pass. 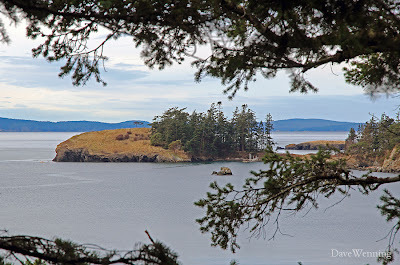 She was a young Samish girl transformed into a sea spirit on this very spot. The cedar story pole was erected in 1983 to commemorate the Skagit County Centennial and to honor the Samish People who once lived here. Stand on the Deception Pass Bridge, look down into the water and you can see her hair drifting with the currents. From the north side of the head, we sighted one Harlequin Duck (Histrionicus histrionicus) diving near Urchin Rocks. I had to crop the photo severely to get a passable image, but you get the idea. The scientific name literally means "dramatic dramatic." They are very theatrical appearing birds. It was a nice sighting for the first day of the year. 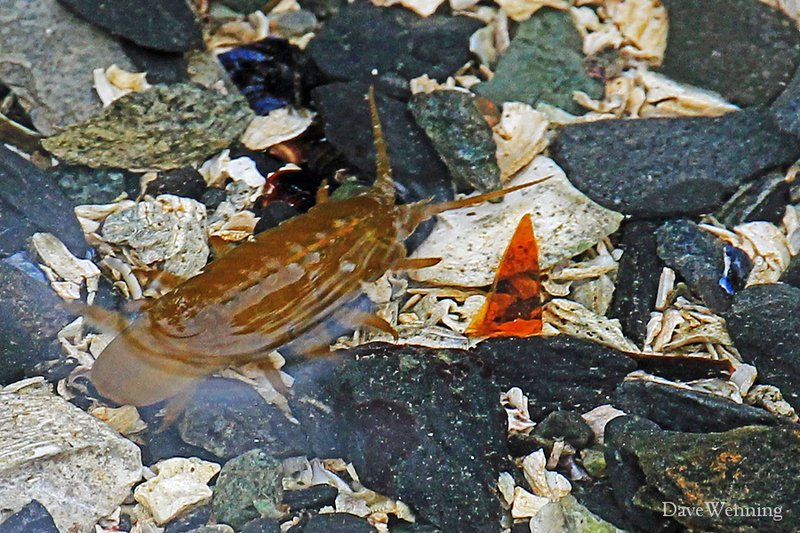 In one of the Rosario Beach tide pools, I spotted this little guy, a creature I had never seen before. With the outgoing tide, it became trapped in one of the pools. Normally, this Vosnesensky's Isopod (Idotea wosnesenskii) only comes out at night, so this was a lucky daytime find. He seemed to be eagerly looking for cover as he swam around the pool. 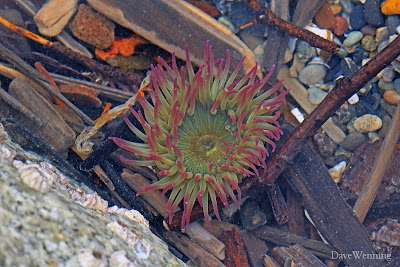 Another denizen of the tidal pools was this Anemone. The green coloration comes from algae living in the soft tissues of the animal. 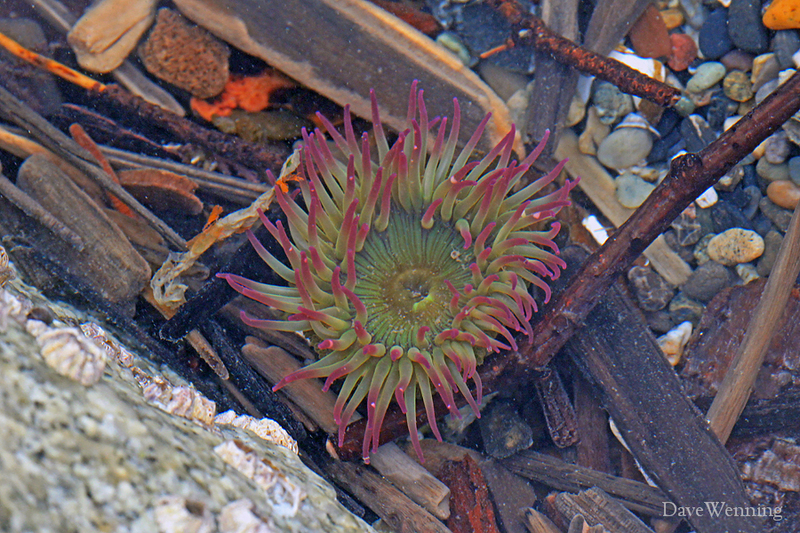 I believe this is Anthopleura elegantissima, the Aggregating Anemone. One way they reproduce is by dividing their bodies or cloning to form small colonies. 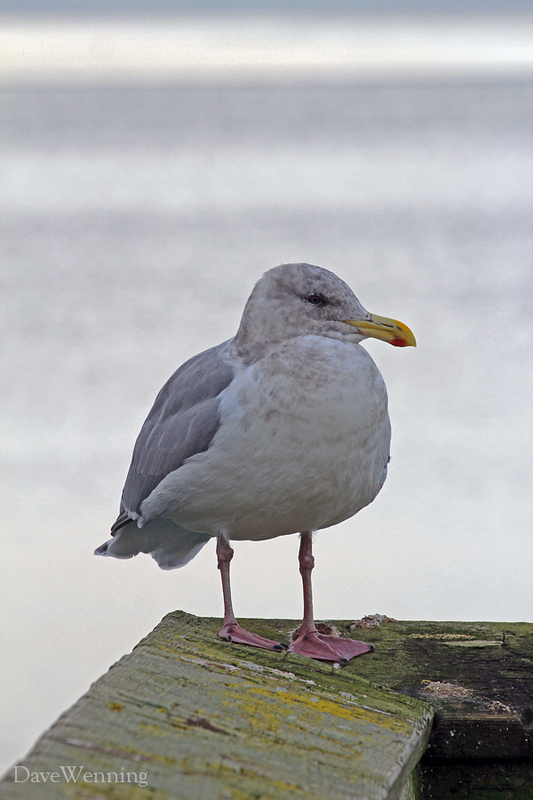 They feed on crustaceans, fish or other small organisms that stumble into the tentacles. The tentacles close and the victim is drawn into the mouth visible in the center. 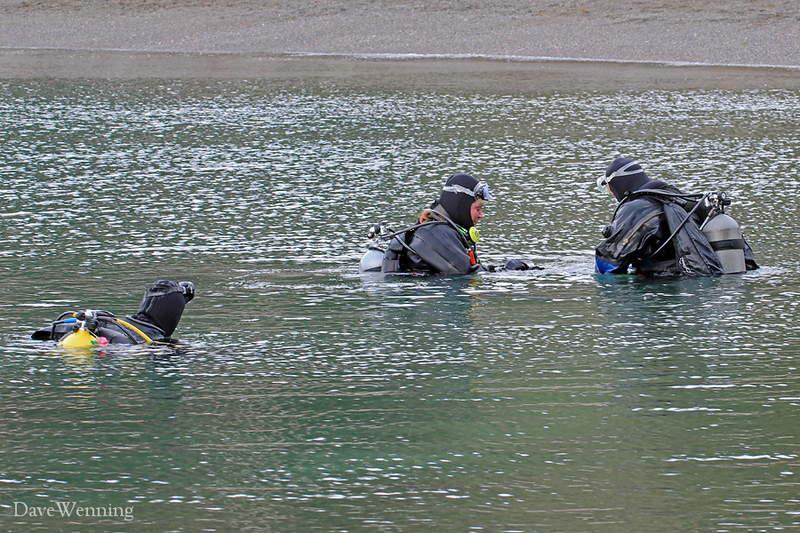 In Rosario Bay, we identified Homo sapiens aquariensis discovered in their natural habitat. From Rosario Head, we got one last look at the mountains under variable afternoon skies. There is probably no better place to spend the first day of the New Year than Deception Pass State Park. It is a place we can explore and do all the things we like. A year ago I hiked the North Beach trail alone on New Year's Eve. It was below freezing, a good 20 degrees colder with nippy winds. On that last day of the year I discovered life after death in the forest. 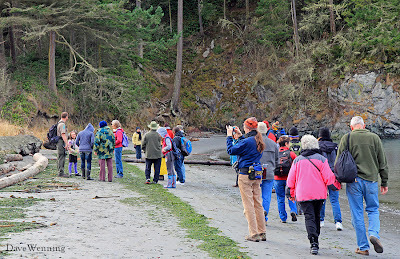 This year, it was a pleasure to meet a friend and join a group seeking new beginnings on this First Day Hike. How fortunate we are this wonderful park has been preserved for us to learn from and enjoy. Great post Dave with terrific shots from your Canon (my rival! )...love your detailed descriptions and narrative. 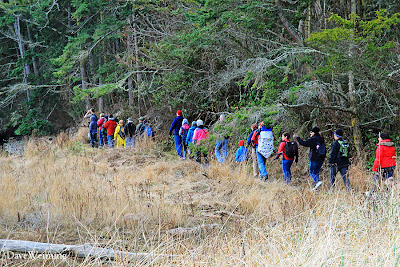 It's fun to see your take of the first hike of the year! 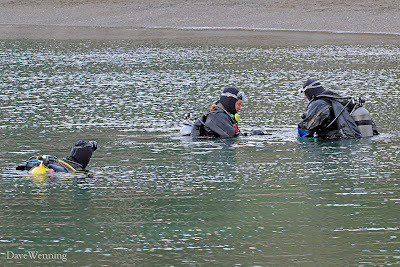 Those scuba divers still cause shivers down my spine!